Toby is a giant sea turtle. One day he watched three human girls swimming in the cove. One of the girls swam over to where he was. She didn’t see him because he blended in to his surroundings and he didn’t move a muscle. Toby thought the girl was pretty. She hid between him and some rocks. He thought they must be playing a game. When she touched his arm she didn’t get frightened, he knew she was special. The girl understood him and he seemed to understand her. She willingly climbed onto his back and together they explored the cove. He swam fast and slowly around the cove. They met many times and had fun together. One time he took her to meet his family. 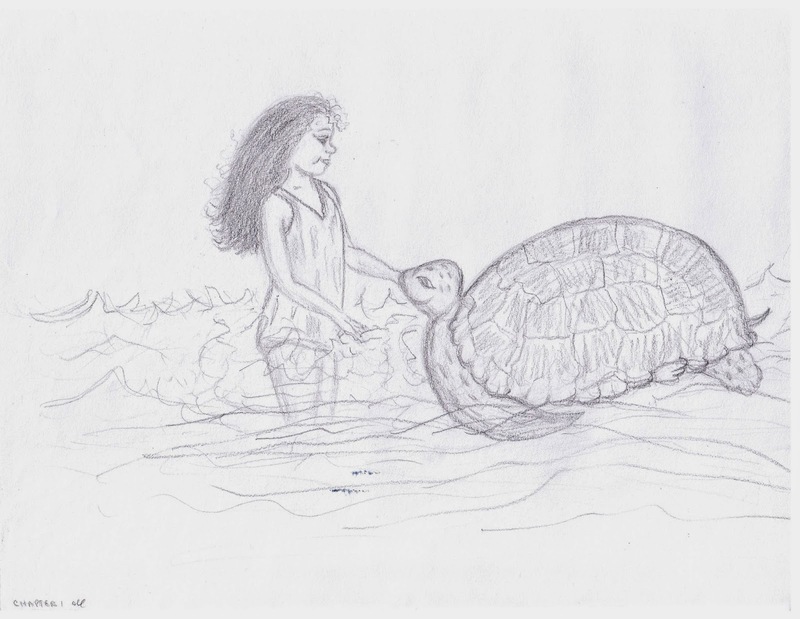 Another time, he took her to a sea turtle that had a string wrapped around his arm. 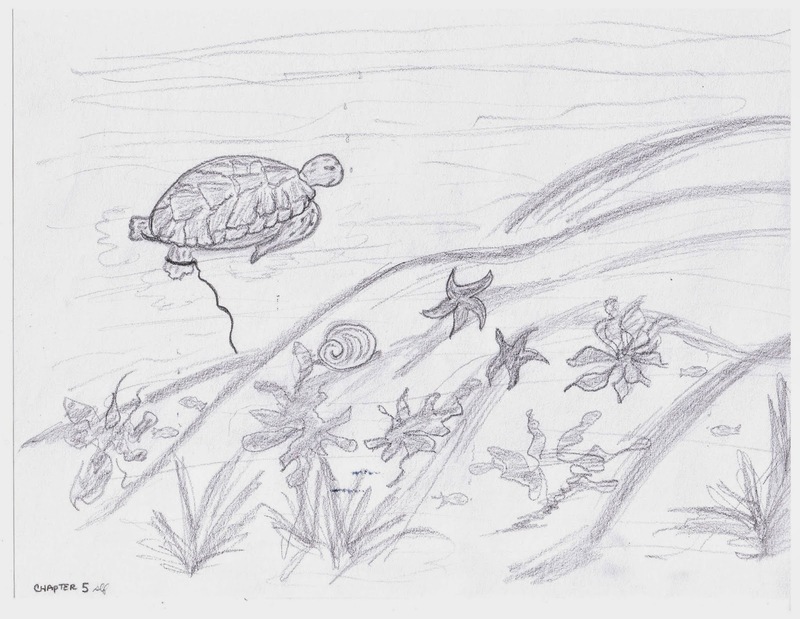 She helped the turtle by unwinding the string and putting mud on its sore leg. “I found her. She is my friend.” Toby explained. Toby swam away without a reply. Those questions troubled Toby. The girl wanted Toby to meet her friends. There were two girls she spent a lot of time with. He didn’t want to share her attention with the other girls. He shook his head every time the girl asked him to meet her friends. Lately, one girl hung around that he didn’t trust. Toby felt torn between what he wanted to do and what was the right thing to do. Should Toby share his friend? Should he meet her friends? There were two other girls he could introduce to his sea turtle friends. They could all take turns giving the girls rides on their backs. Yet if he did that, his special girl friend might like one of the other turtles better. He wanted to keep her all to himself. He didn’t want to share. Sharing is something we all need to do. Sometimes someone has something we want to play with and if we get our hands on it we don’t want to let them have it back. That’s not sharing. Sharing is taking turns with something, or giving up part of something. In other words, if you have a cookie and you give part of the cookie to someone you are sharing. If your friend has a toy you want to play with, and your friend lets you play with it, that is sharing. What do you do when someone has a toy you want to play with, and its taking longer than you want for your turn? Do you take the toy away from them? What if they don’t want to share? Do you grab the toy away from them? The answer is, no. Don’t force something away from anyone. It's hard to wait your turn. Sometimes you may not be able to play with that toy for a long time, even a day. Be big about it and find another toy to play with. Maybe that person will see you having fun, and will want to play with the toy you are now playing with, and you can trade. Sharing is something we all need to learn. We need to share food, toys, books, the bathroom, rooms, couches, chairs, etc. Let’s become the best sharing people in our world. Proverbs 22:9 He who has a generous eye will be blessed, for he gives his bread to the poor. The first church shared their possessions with each other. Acts 4:34 Nor was there anyone among them who lacked; for all who were possessors of lands or houses sold them, and brought the proceeds of the things that were sold and laid them at the apostles feet, and they distributed to each as had need.